All that's new & more! DIWALI DHAMAKA AT THE BOMBAY STORE! The cheerful festive season has set in! Diwali is around the corner and the streets are already bustling with people. The sparkling lights and innovative decorations everywhere is enough to put everybody in the festive revelry. Amongst this merry making, we at The Bombay Store are busy to add on that extra sparkle to your Diwali with #DiwaliDhamaka and offer rewards to you on spending. – Shop for Rs. 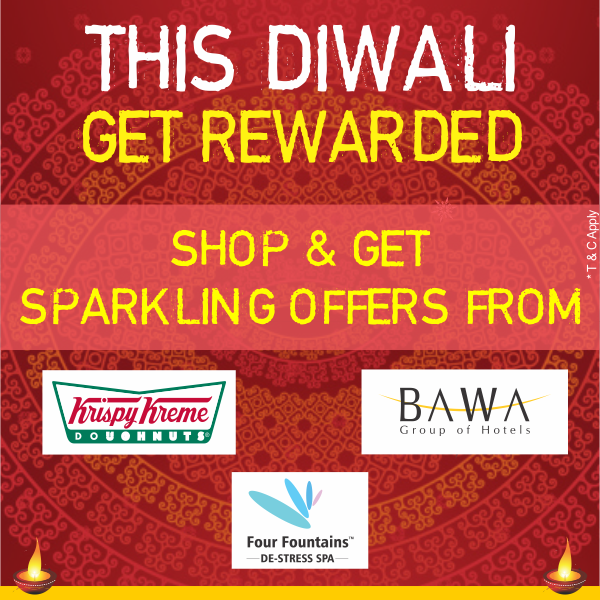 3500/- & Get Sparkling Offers from Krispy Kreme, Hotel Bawa International & Four Fountain Spa, valid at all our Mumbai outlets – PM Road, Colaba, High Street Phoenix, Linking Road, Inorbit Malad and Inorbit Vashi. – Shop for Rs. 3500/- & Get Sparkling Offers from Krispy Kreme & Four Fountain Spa, valid at our Bangalore outlets – Phoenix Marketcity and 1 MG Road Mall. – Shop for Rs. 3500/- & Get Spa Voucher from Four Fountain Spa, valid at all our Pune outlets – MG road and Phoenix Marketcity. Diwali calls for a humongous celebration with family, friends, colleagues and associates. The unfathomable excitement for this festival can be seen at every nook and corner. But the celebrations also call for a lot of never ending preparations for revamping the house, Diwali parties at home and Diwali gifting for near and dear ones. Well with so much to do, we at The Bombay Store have made sure that all your needs are fulfilled at one stop destination. Here we bring to you a wide range of products from elegant Home décor including cushion covers, bed linen, dohars, carpets, wall arts and frames for an ethnic and contemporary feel to a wide range of Kitchen & Tableware; Fashion accessories consisting of stylish handbags, silver jewellery, quirky Ipad sleeves/laptop bags; Mementos, a wide range of Tea and Artefacts to adorn your home and for gifting. We also have an exclusive ‘Diwali’ collection of Pooja Items, Rangoli, Toran, Diya, Candle/T-lite holders and an extensive range of Auroshikha candles, diyas and gift sets. Apart from this we also have a premium selection of gifting options for Corporates to help express your gratitude to your clients, business associates and partners.